This past March I saw Fuerza Bruta in New York City. They are hard to describe really: a dynamic dance performance group doesn’t really say it. It’s one of those things you simply have to experience. But I’ll tell you this: it involves several elements, including wind, blood, sweat and tears. Doesn’t sound appealing? Maybe Usher’s rendition of “Scream” that he recently performed at the Fuerza Bruta show will help you along. It’s hot. Sensual. And partly underwater. Curious? Give Scream a try. Happy Weekend Sensual, all! If you have a living memory of this day ten years ago, it is a day you will never forget. The atrocities, the suffering, the heroism and the long-lasting impact of September 11th have forever marked our world’s landscape. It was also the day that air travel changed. Forever. For anyone who has had to nearly disrobe at security, suffer the scrutinizing scorn of a guard who thinks your ten-year-old might be hiding something under his hat or feel the pervasive insecurity of being airborne for, you hope, the entire flight, the wave of terror still rings in our ears. You may have watched the tributes, read the decade-later stories or even attended a commemorative service today. But one thing I would like to mention is that humanity lives on — even in the face of such inhumane events. 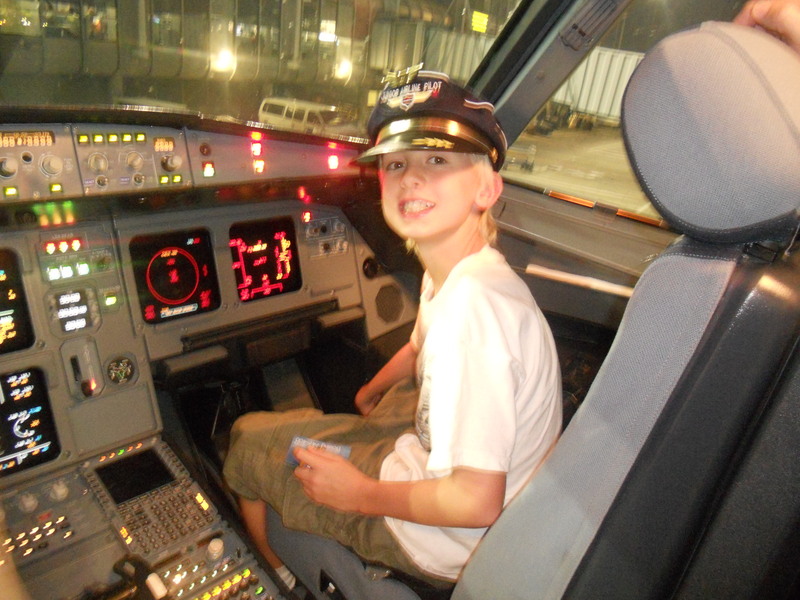 When my son boarded a United Airlines flight from Las Vegas to Chicago recently, he proudly wore his pilot’s hat. The stewardess suggested we meet the captain at the end of the flight. I thought perhaps he would come out of the cockpit and meet us in the safety of the jetway. But no, he invited us into the cockpit itself. I got to take a picture of my son sitting in the co-pilot’s seat. I even was allowed to flip a few switches to which the pilot mock-yelled “Don’t touch that one!” after I had. I jumped a foot in the air (which is hard to do in the confines of a cockpit). He was as kind as could be and even though we had under sixty minutes to meet our connection to Munich, I took the time because I wasn’t sure if my son would ever get to live in a world that allowed this again. The kindness of the United Airlines folks goes further. Because a gate crew member reminded my husband that his frequent flyer miles had not yet been recorded, Husband asked for the crew to record his miles at the gate in Chicago. And from that request came another offer, this time from Lufthansa (our connecting airline): a free upgrade to Business Class, which Husband graciously offered to me. Kindness goes around and around, from the ground crew to the air crew to the next one at O’Hare. There is humanity in this world, even at airports and on airplanes. Terror has no place where love can grow so beautifully. And it can grow anywhere. Even in a cockpit four feet wide. Life is not a plan. It’s a journey. This is something my mom knows well. So it was fitting that, as we journeyed NYC-bound on the Acela Express, we would soon learn not only people can travel, but things can, too. You see my mom lives in the belief that life is a God trip; God only knows where you’ll end up. As we zipped up the East Coast toward Manhattan, I helped her set up her blog, aptly named Life is a God Trip to celebrate her philosophy in an online space. Snapping a photo of her, I wanted to capture her joy. But little did I know that that photo would be the key to the camera itself. We got settled in our hotel room, had a nice meal and retired early as we knew the next day would be long. Up at dawn, we breakfasted, then took a taxi to the harbor for a boat tour of Lower Manhattan. It was then that I realized my beloved camera, the holder of so many memories during my mammoth five-state five-week trip, was gone. I should have known the camera had its own ideas. It had slipped from my lap and into my bag on the train. Little did I know it was practicing its escape! Later that day, I half-heartedly asked the hotel security if they had seen the camera. They had not. Saddened, but steeped in my God trip knowledge, I sensed the camera had decided to take its own journey. Yesterday a woman left a comment on my mom’s blog, explaining she lived in Venezuela and that her mother had found a hot pink camera in a NYC taxi. She scanned the pictures to find a clue as to the owner’s identity. That’s when she came upon my mom’s photo of joy in front of her newly birthed blog. She must have read the URL, then matched her picture to the one on the camera. She was writing to ask for the address so that she may return it on her trip to Florida, where my own God trip in April began. No, my friends. Life is not a plan. It is indeed a journey, one of joy and grace and miracles. For this I am forever grateful. Thank you, Alexandra, of Venezuela. Your kindness will live on in all that I do. Good Housekeeping, that housewife’s magazine that’s been around since 1885, is keeping with the times by developing a new green Good Housekeeping seal for products its new environmental advisory board considers ‘green’. It’s an interesting concept that shows how far our consciousness has come. But not all green things are golden. As my friend, who works in a consumer advocate’s office herself, once said, “Just because it has a seal, doesn’t mean it’s good for you or the environment.”Organic cookies? They contain sugar, too. I had proudly swept my hand across a drawer of organic products to show her what a good green person I was! She peered inside, then frowned. I realized how many of them were contained in plastic, with wrapping or had travelled from afar to land in my cupboard. To quote Kermit the Frog: “It’s not easy being green.” But Good Housekeeping‘s efforts (see below) are admirable and it’s a sign of our ever-changing times. We’re trying, folks. Really, we are! Good Housekeeping has created an Environmental Advisory Board consisting of leading sustainability experts from non-governmental organizations (NGOs), academia, and media to provide insight for the Green Good Housekeeping Seal evaluations, pinpointing areas of biggest concern, and educating the magazine’s more than 27 million print and online readers through interviews for editorial articles. Inaugural members of the Good Housekeeping Environmental Advisory Board are: Laurie David, producer (An Inconvenient Truth) and award-winning, bestselling author; Wood Turner, Executive Director for Climate Counts; Suhas Apte, Vice President Global Sustainability for Kimberly-Clark; David Bennell, Executive Director, Textile Exchange; Pamela Brody-Heine, Product Stewardship Manager, Zero Waste Alliance; Jill Dumain, Patagonia; Sally Edwards, Sc.D, Research Associate at the University of Massachusetts Lowell Center for Sustainable Production; Katie Galloway, Earth Fund Manager for Aveda; Reid Lifset, M.S., M.P.P.M, Associate Director of the Industrial Environmental Management Program at Yale University; Erin Meezan, Vice President of Sustainability, Interface; Ursula Tischner, Program Coordinator Design for Sustainability at Savannah College of Art and Design; and Mary T’Kach, Energy and Sustainability Coordinator, Ramsey County, MN. 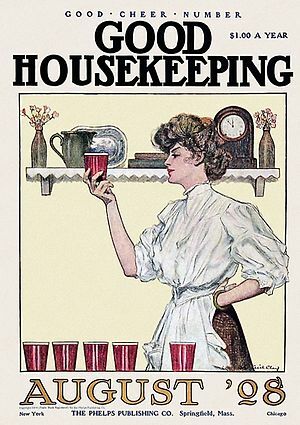 In celebration of Earth Day, at 10AM on Friday, April 22, Good Housekeeping will host a special environmentally-focused tour of the Good Housekeeping Research Institute, the magazine’s state-of-the-art product testing laboratory (I’ve never been, but boy! Would I love to go!). Visitors will have an opportunity to meet the engineers, chemists, nutritionists, and all of the Research Institute’s expert staff, learn more about the Green Good Housekeeping Seal, and visit the famous Good Housekeeping Test Kitchen to hear about the increasing interest in vegetarian recipes and participate in a taste test. You can sign up for the special Good Housekeeping Research Institute Earth Day tour here. Good Housekeeping created the Green Good Housekeeping Seal to set a mainstream bar for consumers who want to live a greener lifestyle. The scientists and engineers at the Good Housekeeping Research Institute worked with Brown & Wilmanns Environmental, one of the nation’s leading green consultants for businesses, NGOs and governmental organizations to establish criteria for the Green Good Housekeeping Seal. Before being considered for the Green Good Housekeeping Seal, a product must pass evaluations for the primary Good Housekeeping Seal, which evaluates claims and measures efficacy to ensure it performs as promised. If the product passes, it is then reviewed using more in-depth environmental criteria, including the reduction of water use in manufacturing, energy efficiency in manufacturing and product use, ingredient and product safety, packaging reduction (see my post on plastic), and the brand’s corporate social responsibility. And it seems their evaluations have fairly rigorous standards. Products that have earned the Good Housekeeping Seal and the Green Good Housekeeping Seal carry a limited warranty: If the product proves to be defective within two years of purchase, Good Housekeeping will replace the item or refund the consumer. You can get more answers to the most frequently asked questions about the Green Good Housekeeping Seal here. Continuing to establish a leadership role within the environmental industry, Good Housekeeping is co-sponsoring with The Daily Green the Good and Green conference, a two-day conference on May 11 and 12 featuring a series of environmental-themed sessions, keynotes, case studies and roundtable discussions. I will actually just miss it as I’m leaving NYC on May 11, but for those who are interested, Good and Green will be held in the Hearst Tower, the first LEED-gold certified office building in New York City. You can register to attend the Good and Green conference here. Tracey Frost, founder of the New York-based community center, Citibabes, provides great guidelines to move your kids away from the screen and into the green this summer. – Ignore the Whining: It’s important for parents to understand that for children, TV may always seem like the more fun alternative. There will probably be a lot of whining when you turn the TV off and plan a “real world” activity, but I promise: once the kids are engaged, they forget all about what they are “missing” on TV. – Think like a TV Producer: Examine your child’s favorite TV shows from a television producer’s eye and pick out exciting elements of that show you might be able to turn into a real world activity. Do your children love action and superheroes? Find a comic book shop in your neighborhood and make a trip. Is it fantasy they enjoy? Go to your closet and play dress up or, better yet, bring some dress- up clothes to the park for an afternoon of make-believe. For instance, if your child is obsessed with Dora, pack a backpack for the day, draw a map, and go on your own “exploration” of your neighborhood or city. Sure, children love watching their favorite characters on TV, but they love playing their favorite characters even more. – Live Performance: One of the joys of living in New York City is the sheer amount of live performance available to families, from puppet theater to Broadway shows, there’s something for every child out there. I strongly encourage families to seek out local community theater, dance or music and exposing children to the energy of live performance. It’s a wonderful counterpoint to watching something on TV and you can discuss the differences between the two when the curtain falls. What are the best TV shows for kids? While Tracey didn’t want to name names, she says she selects shows by their level of participation such as those shows that invite kids to get up, dance and sing along. I can’t see my eleven-year-old getting jazzed to do that, but she gets a lot of exercise just going to school and back every day. A little vegging out in front of the tube on vacation and weekends is okay as long as it’s not the only way they enjoy the slow. – Make your own TV show or Movie: Create your own characters, costumes, plot and scenery for a class movie. Let the kids hold the camera, yell “Action” and direct their friends for hours of excitement. – Make your own Storybook: Whether it’s a story about a television character your child likes or something they’ve made up completely, have your child narrate while you document their words verbatim. Help them if they’re stuck by asking questions about the character and plot, but try to let the child create the bulk of the tale’s action. When they’re done, divide up the words on several pages for the child to illustrate like a real storybook. – Scavenger Hunts: Scavenger hunts are great warm weather activities that get kids out of the house. We actually use them a lot in the club in our preschool class, whether we’re learning about Australian animals or going on an African safari – we hide stuffed animals around the club for children to find. You can take this game outside very easily, either in teams or one-on-one with your child. Variations include doing a photo scavenger hunt where you take pictures of things on your list or the more traditional version where children have to retrieve items or information from various neighbors or local businesses. – American Idol Sing-off: Turn on the CD player, if you don’t have a karaoke machine, and let your kids belt it out. It’s fun to play dress up before the big “show”, maybe choreograph a few moves and, at the end, you can even record it and play back the video for all to watch before it’s time to go. Art imitates life. It’s fun to have a blend of both as Tracey suggests. 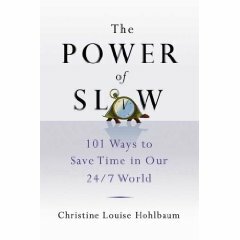 With her tips it truly is possible to embrace the power of slow without drooling in front of the tube for hours on end. You’ve all heard me say it. Limit screen time for yourselves and your kids. One person even said I believe TV is the source of all evil. Not so. I wouldn’t work in TV if I thought that. Toddlers, however, have other things on their minds than watching images pass through the screen: such as learning how to navigate the furniture without falling down and potty training. According to a recent study, children age two and under should not watch any TV at all. The ramifications shows up later (by fourth grade), according to the report. Believe me. It’s not worth it. My then-eighteen-month-old took in the story of the three little pigs while playing blocks. He never watched the screen (my three-year-old did), but the sound of the Big Bad Wolf haunted him for years. I mean years! So, cutting down on screen time is a super duper power of slow idea. How? If you’re in Manhattan or Scarsdale, New York, consider this community, Citibabes (their blog, launched today, literally rules!). I sat down for a cyberchat with Citibabes founder Tracey Frost to discuss the importance of community. The power of slow says the meeting of the minds uplifts. Have a listen to Tracey Frost!